The Prices Are Shown Above. Depending on the fit and pattern, covers are made with an elastic bound edge around the outside perimeter of the seat and elastic straps with Velco® and /or clips and hooks to hold the cover securely to the seat. Some dual seat covers are made in two pieces. with Velco® and /or clips and hooks to hold the cover securely to the seat. Some dual seat covers are made in two pieces. All Custom Covers Are Made To Order. We Have Hundreds Of Patterns For Seats And Backrests. If We Do Not Have A Pattern We Can Measure The Seat At A Dealer’s Showroom If Available. If you prefer you can email: info@blacksheeptrading.com. NOTE: we can talk faster than we can type so if you're in a hurry call. Of the motorcycle and we will custom tailor a seat cover specifically for your seat. 1 year WARRANTEE on materials and workmanship. 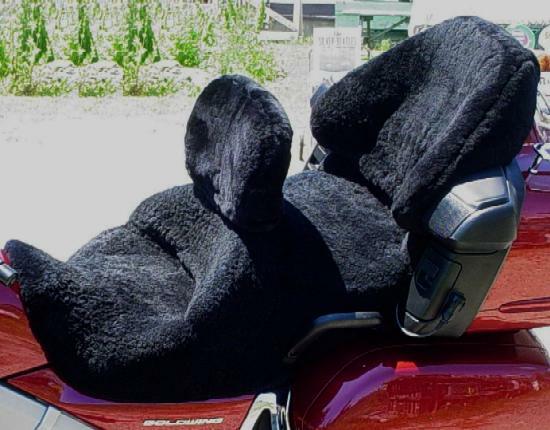 Custom sheepskin motorcycle seat covers are made specifically for the year make and model of the motorcycle and will fit your seat like a glove. The seat cover protects your seat's upholstery and prevents the leather from fading and drying. Please allow 2 - 3 weeks for delivery after ordering. TREAT YOUR SEAT TO SHEEPSKIN! 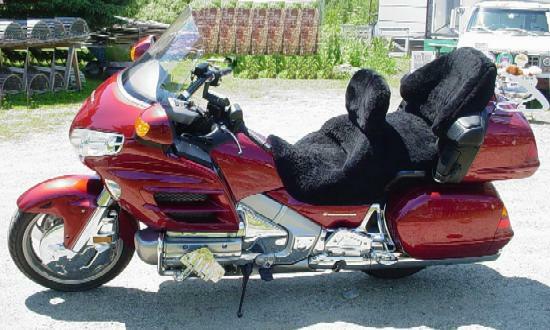 CUSTOM SHEEPSKIN MOTORCYCLE SEAT COVERS ARE AN EXCELLENT INVESTMENT!! Furrier dry cleaning is recommended. Colors may fade somewhat with time from direct sunlight exposure.